ViewSonic which is considered as the one of the most trustable LCD sellers for PC, has now moved into another line by launching its 27 Inch HD Monitor. It sounds as if its just a normal monitor. But not, its basically meant to be used as a Television set, though it is said by the officials at ViewSonic that it is completely compatible with Computers & Gaming Consoles. It has improved functions as compared to a normal monitor. It even comes with Integrated speakers which are hard to be seen due to its slim size which reduces space. Its version is VX2739wm which is going to be the future of most monitors as its the world’s first 1ms Monitor. It even has full HD technology of 1080p, 100,000:1 dynamic contrast ratio & with an aspect ratio of 16:9 widescreen. Now, lets see what makes the ViewSonic VX2739wm so special & different from other monitors available in the market. 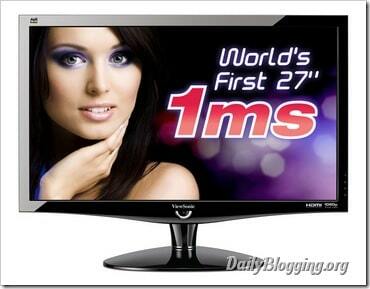 ViewSonic VX2739wm comes with 1 ms response time and sets a record of being the first one to introduce this feature. Now people may have a doubt regarding response times. So let me clear it first and explain it to you that, A Response time means how much time it is taken by the device to change its colours from black to white and again to black. It is recorded in milliseconds (ms). The lower the value the higher the quality. As I had mentioned earlier in this article that it has speakers which are hard to see visually, but they do make quality sound effect as they are powered by SRS Premium Sound technology. It has some amazing features like deeper bass, Surround Sound,etc. SRS Premium Sound is a product of the famous SRS Labs. It comes with its software CD included in the ViewSonic package. It comes with HDMI (High Definition Multimedia Interface) technology which enables us to connect the monitor and use it with DVD Players, Desktops, Laptops, MacBooks & even Gaming Consoles. Although it won’t be having a TV Tuner function but it is said that as a replacement the HDMI wire + a Receiver Box Transmission would provide the same service. With 1080p HD (High Definition), 100,00:1 Contrast Ratio & 16:9 Aspect Ratio you would enjoy the experience whether you use the monitor for Gaming, as a Desktop or for watching movies on your DVD Player. Already it gives 1ms response time, what more you need for entertainment and clarity! This is the feature that I liked the most. Now as resources are getting waster, depleted or used in an unwise manner ViewSonic has shown concern over this by adding the Eco – Mode, which we normally see in Air – Conditioners, Refrigerators,etc. It gives you two options to choose from, The Optimize & Conserve. It is said by the company that both the options will reduce the power consumption by 35 % when activated by automatically turning certain features which isn’t used at that moment. Both the above P’s are Important for us before going for a product. 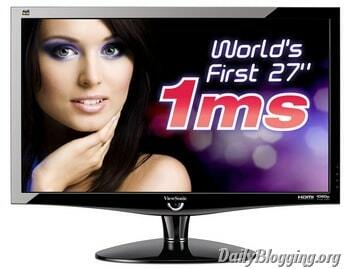 ViewSonic VX2739wm comes for about 25,000 bucks (Rs. 24,999) to be exact. It also offers best pixel performance guarantee & 3 year Warranty on this product. So if you are planning to buy an LCD TV, then buy this one, as you never know when you want to use it a LCD Monitor for pc, gaming console or for watching movies in HD Display! So what do you think about this very new outcome from ViewSonic ? Share your views with me using the Comments Section. Sure you can but make sure you backlink to the post url. By Prize you mean Price, right? Iam a regular student of BA.3rd year…iam very excited to see the newly launched cheapest laptop for students n i really want to know when will it b release?